In freelance work, having legal contracts between you and the clients you work with is important. Contracts legally protect you and your business in various ways and helps in making sure that you’re properly compensated for the work that you do. What follows are a few tips you should keep in mind when you’re drafting your contracts for your design services. Though we’ve focused on the needs of designers, these tips are also applicable to a wide range of professions (especially creative services professions). Don’t just agree to performing freelance work by shaking hands with the client or replying “OK!” to an email. You should always have a written contract that summarizes the work to be done, the business terms and other legal details that might be boring to read, but can actually save you a lot of trouble down the road. Sample contracts aren’t hard to find, but of course, an attorney is a good first option to take. If you’re lacking the funds for hiring a good lawyer, see if you have legal pro bono associations (like Volunteer Lawyers for the Arts) around your area that you can look into. 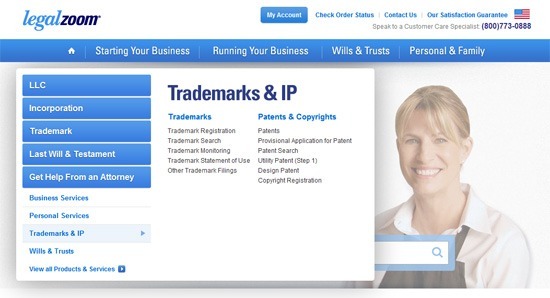 Also, there are some websites that sell legal document templates such as LegalZoom and U.S. Legal Forms. 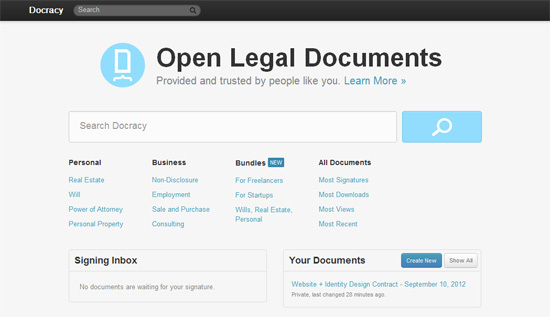 You can find legal documents and get answers to legal questions on sites like LegalZoom. 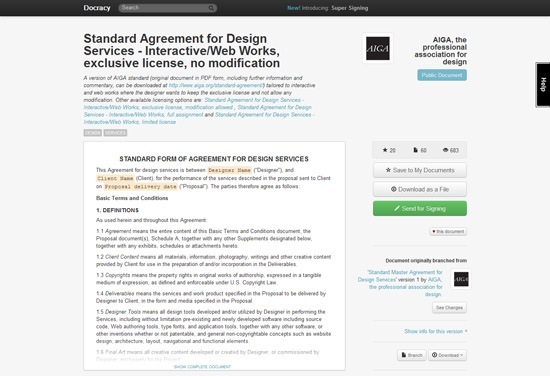 There are also some free internet sources that provide contract templates and guidelines for designers, such as Docracy (full disclosure: I work at Docracy) and the AIGA. Docracy provides socially-curated, free legal-agreement resources. You can even take your chances by searching for design contract templates on Google. This is one of the most common mistakes that people who provide creative services make: Giving up the rights to their work before they’ve been compensated. Upon completion of the Services and full payment of all invoices, the Designer shall assign IP rights to the Client. These IP rights include all ownership rights, including any copyrights, in any artwork, designs and software created by the Designer and incorporated into a Final Deliverable, except as otherwise noted in this Agreement. You should have a fee for projects that are unexpectedly terminated or projects where your client changes their mind and no longer wishes to continue. Temper your kill fee with clear milestones, making sure to have written proof of acceptance for each deliverable. In the event of cancellation of this assignment, ownership of all copyrights and the original artwork shall be retained by the Designer, and a cancellation fee for work completed, and expenses already incurred, shall be paid by the Client. Cancellation fee is based on the hours submitted, if the project is on an hourly basis or a percentage based on the time estimate for the entire job. A 100% cancellation fee is due once the project has been finished, whether delivered to the client or not. If the project is on an hourly basis and project is canceled by the client, the client agrees to pay no less than 100% of the hours already billed for the project at the time of cancellation plus a flat fee of $250 or 50% of the remaining hours that were expected to be completed on the project, whichever is greater. If you’re starting from any decent contract template, it’s a bad idea to start modifying the legal clauses without the help of an attorney because altering the text might affect the goals, effectiveness and validity of the contract. However, one of the parts that you have flexibility over is the statement of work. You need to modify this part so that it’s relevant to the project you’re about to embark on. The statement of work helps avoid project scope creep by outlining what your deliverables are and what you’re required to do. A good statement of work should give you the basis to charge additional fees for work beyond what you’ve initially agreed to do. If you’re afraid that your clients will keep trying to expand the scope of the project, be as specific as possible, so you then have grounds to charge extra for additional work. At other times (particularly in longer and more unpredictable projects), being vague may be preferable. Who said legal documents need to look boring? As long as your contract has all the essential parts, you’re free to improve it and turn into an actual object of design. After all, it’s something coming from your desk and therefore contributes to your brand as much as a business card does. Additionally, a professional and beautiful contract can give the client more confidence about working with you. 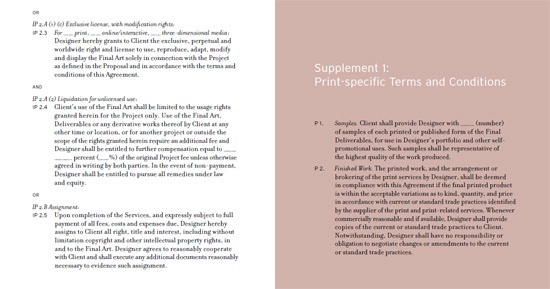 Two pages from the AIGA standard form of agreement PDF. Page numbers are essential in longer contracts, and usually placed in the footer. Don’t forget them! Legal stuff is not the most entertaining to read, so it needs all the help it can get! While sometimes it’s not financially viable to go to a lawyer, there are certain situations that would greatly benefit from consulting a lawyer. For example, if the client starts making a lot of changes or starts saying stuff like “it’s standard” or “we do this all the time”. Few things are non-negotiable in service contracts, and this is usually an excuse to throw in a provision that, invariably, will not benefit your side. Designer contracts are pretty standardized, thanks to the work of AIGA. Don’t be afraid of pointing the client to this model contract to show what the standards of your industry are. If the contract you’re signing is from the client and something doesn’t sound quite right, have your lawyer take a look at the contract before you sign. Read everything closely before signing, and compare the terms with designer-friendly contracts available on the Web (such as those mentioned above). Keep in mind that this article is meant to share some tips on drafting contracts, but it’s not legal advice. All the legal documents cited should be used only as a starting point. Don’t forget that legal stuff is important, and a good lawyer can help you review these examples and tailor them to your particular project and local laws.